A lovely, sunny day off today so we took ourselves off on a walk along the Thames to Richmond. Is it finally summer!!! Unfortunately I forgot my phone so have not been able to take a photo of lunch, and this is a massive shame as lunch was great- The Duke, 2 Duke Street, Richmond. This was our first visit and I don’t know why we have never been there before as it was great. Fabulous food, large selection of wine and beers, and more than that fantastic service. Colin had sausage and mash with a sweet jus, and I had a pan fried sea bass on a Colcannon with a crayfish butter. I so wish I had taken my phone as it was all presented beautifully and tasted even better than it looked. Potentially our new favourite lunch place. 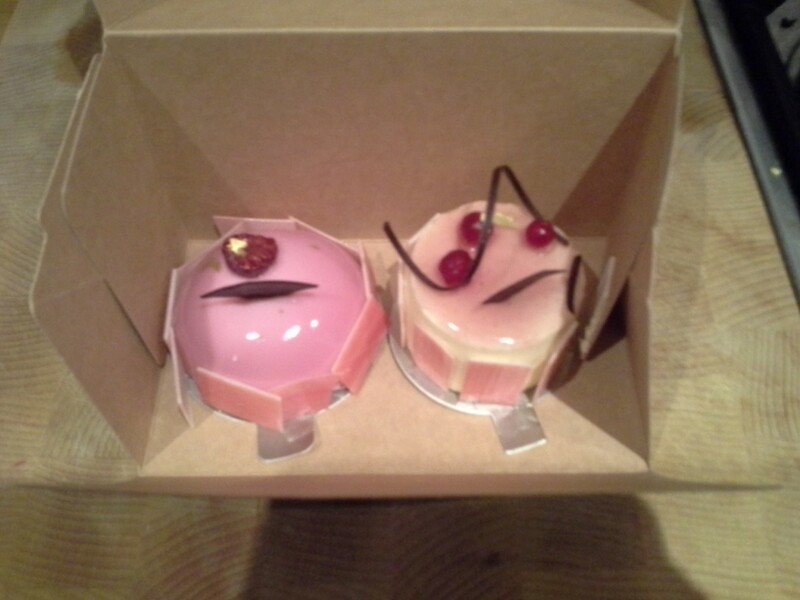 Another first was a dessert bought from William Curley. We have had chocolate from him before, but never a dessert. They looked so inviting in the shop as we walked past that it was actually impossible to keep on walking! The shop massively reminded me of patisseries in Brussels, shops I do miss. 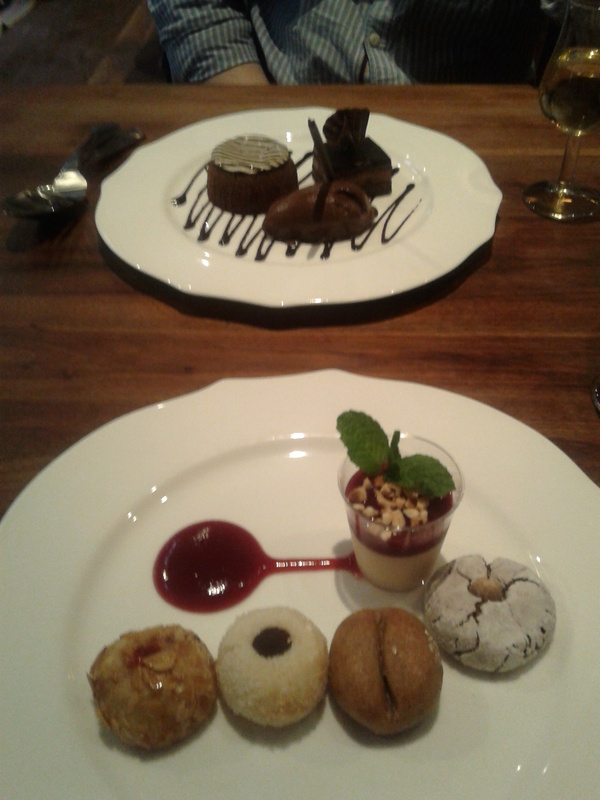 On the left is my dessert, a lychee and raspberry dome of loveliness! Colin’s on the right is a fromage blanc, and it was light, with a crisp base and raspberries. Delicious and a great way to end a foodie day off. Tomorrow we are going to have an Indian takeaway from Minar in Hampton. 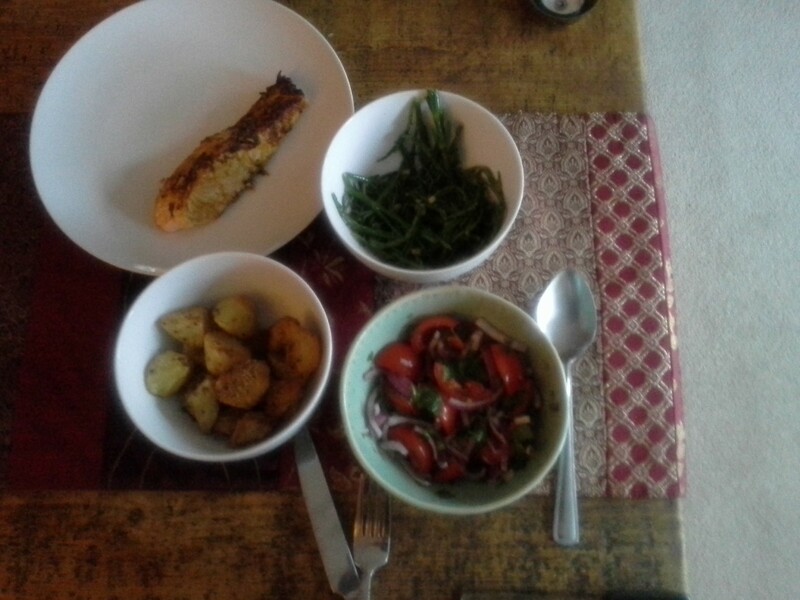 A lazy Friday night dinner as I will be packing for my holiday in Devon. After work on Saturday I am headed to Appledore, near Barnstable, for a few days with my Mam and little sis, Marie. Colin will join us on Wednesday after a few relaxing days at home. Fingers crossed for sunshine!! This was the first time we have had these particular sausages and it won’t be the last. Quite peppery, very juicy and quite addictive! 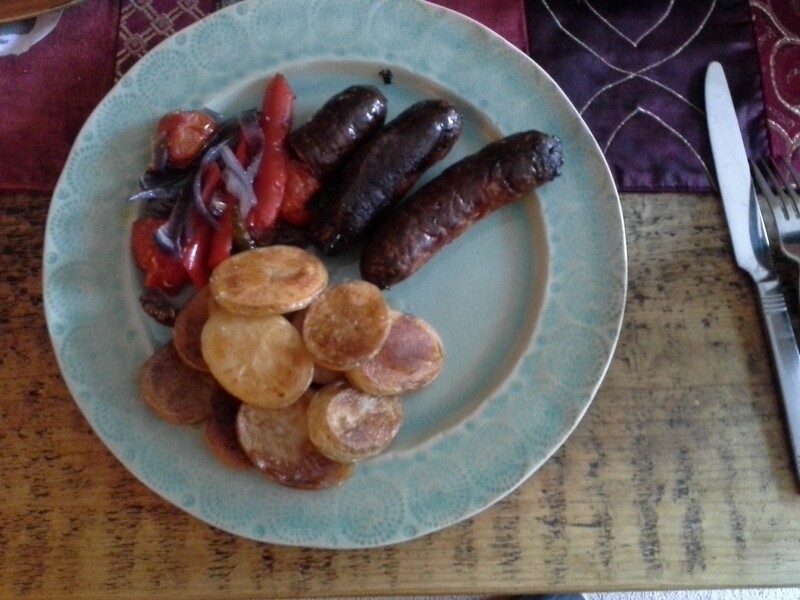 Here we have eaten them with some olive oil roasted slices of potatoes and sautéed red peppers and onions. We also bought some pork and pistachio sausages which are currently living in the freezer ready for some inspiration to strike! Tomorrow I am on late night so no dinner for me, but Colin is making a chilli for himself and in readiness for the weekend when I am away in Devon and he is home alone….. The new Rick Stein has had a second outing this week! 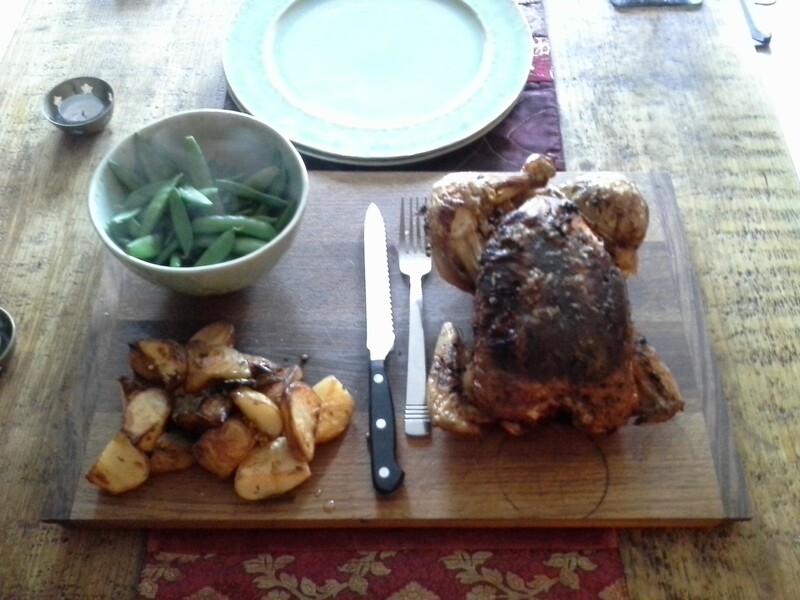 We are looking forward it watching the new series tomorrow night, but tonight we have made an Indian roasted, stuffed chicken dish with spiced roast potatoes. This recipe does call for a good free-range chicken- the juices mixed with the spices from the stuffing made a delicious gravy. 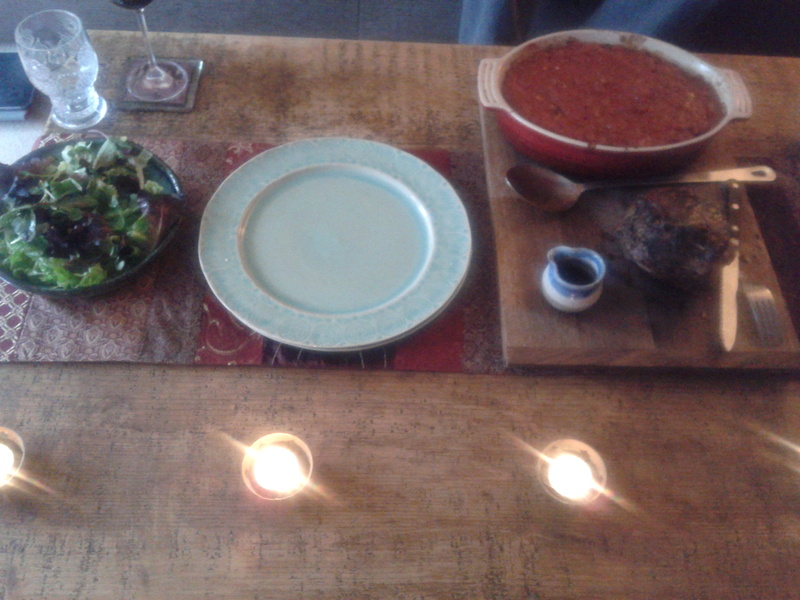 The chicken was stuffed with a mixture of pork mince, cashews whizzed up in the food processor, cinnamon and allspice. Another stuffing mixture was made with the same string but without the pork mince- this was then stuffed under the skin. The potatoes were simply par-boiled and then tossed and roasted with mustard seeds and curry leaves. The book is well worth it, 2 recipes in 1 week is a good hit rate! What a great day! A perfect day apart from the weather, and one that makes me so happy to live so close to London. 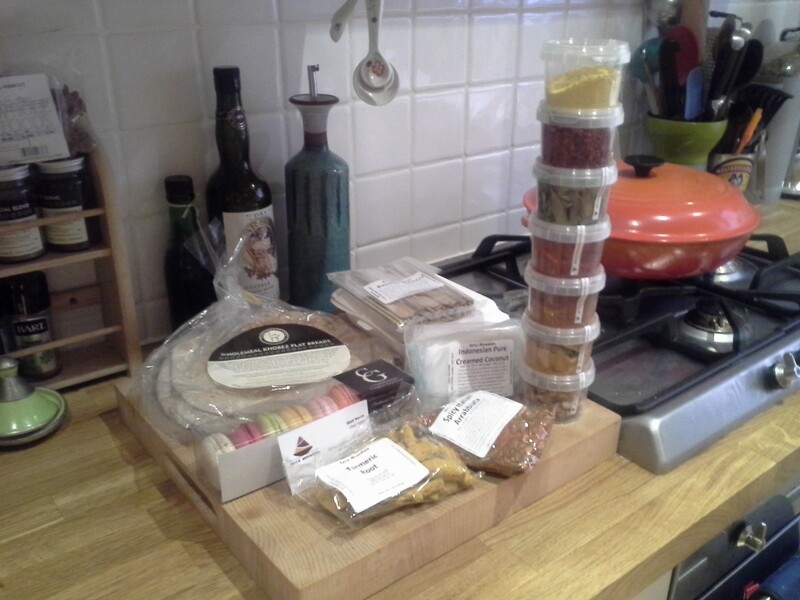 In the morning we headed out to Borough Market, and what treats we have come home with!!! We visited the best Spice shop (in my opinion)- Spice Mountain. I was worried as there had been a move around in the market and on a previous trip we couldn’t find it, but this time a success and goodies have been bought, as well as some mini bamboo skewers to make some groovy little kebabs with. As well as spices we have got some sausages from The Ginger Pig, some pork & pistachio and some Lincolnshire, and some great Mayfield cheeses. We got to Borough market early in the morning which is such a good idea as you can actually get near the stalls, anytime after 10 and it is absolutely heaving, and it is so disappointing to get all that way and not get to easily see all the goodies on display. For lunch we headed to Momo, just off Regent Street. We have been once before and have been planning a trip back ever since. 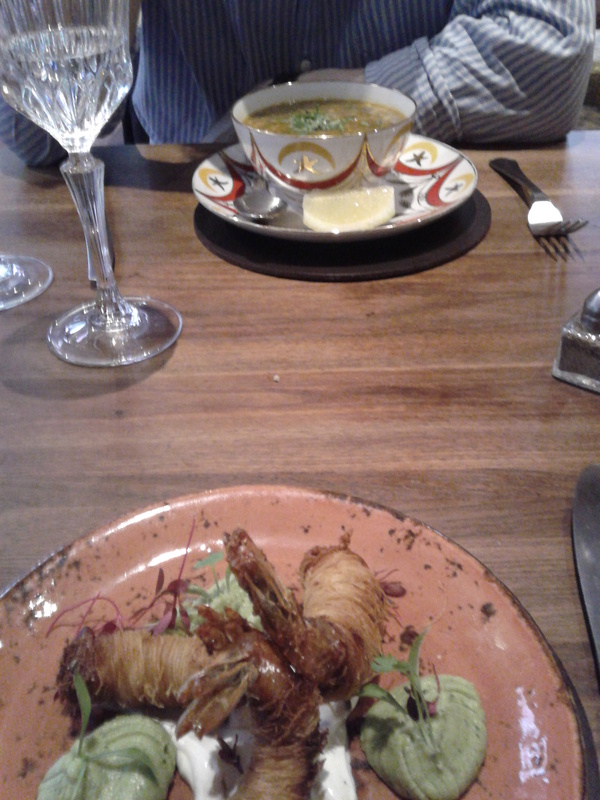 For starters Colin had a vegetable harira soup, lightly spiced and fragrant with preserved lemon. For me some prawns wrapped in K’taiffe, with an avocado purée and labneh. This was absolutely delicious, crispy from the pastry and beautifully presented. 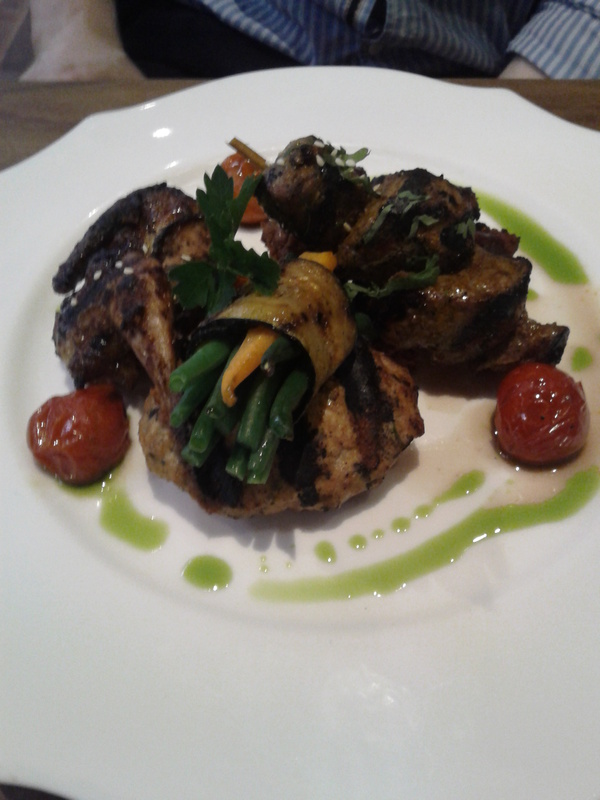 For main course Colin had a mixed grill: there was some chicken, some lamb, and a really lovely marinated quail. 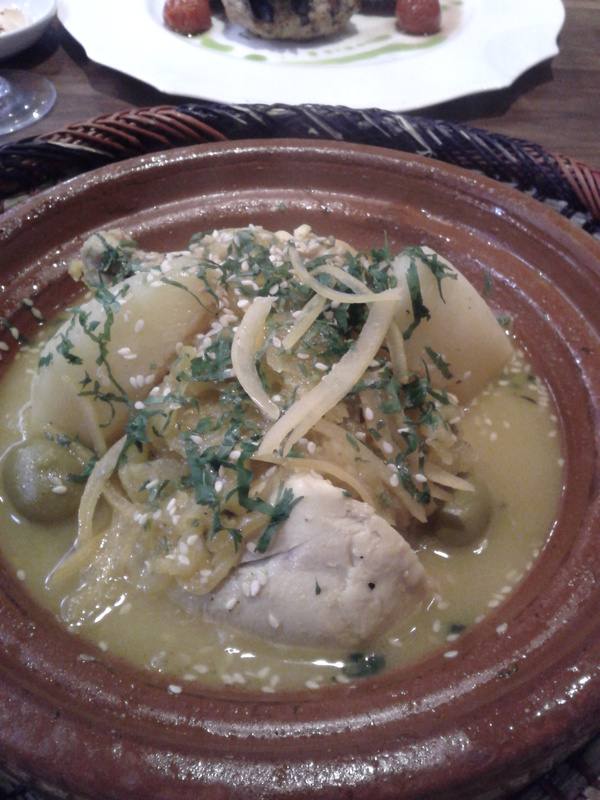 I had a chicken tagline, gorgeously fragrant, with big hunks of chicken and potato, green olives and preserved lemons. Truly delicious. Despite being full we couldn’t turn down some desserts, washed down with a crisp glass of sauternes. For Colin a plate of mini chocolates, for me a plate of small traditional pastries. Momo is such a delight to all the senses. The décor is beautiful and the ambience spot on- you would never believe you were just off the hustle and bustle of Regent Street. Now we are planning our next trip, and not leaving it so long! June is the month for birthday’s in my family, Dad and Marie last week, and Mam tomorrow. I will see Mam very soon as we are going to Devon for a mini holiday, but Tonight’s dinner is dedicated to her in the meantime- happy birthday Mam!!! mix together all the ingredients apart from the fish. Rub all over the salmon and leave for 20 mins. either fry in a little oil or roast in the oven until just cooked through. New cookery book alert!!! Colin arrived home last night with Eric Lanlard’s ‘Tart IT Up!’, his new release, and it is full of delicious looking recipes. 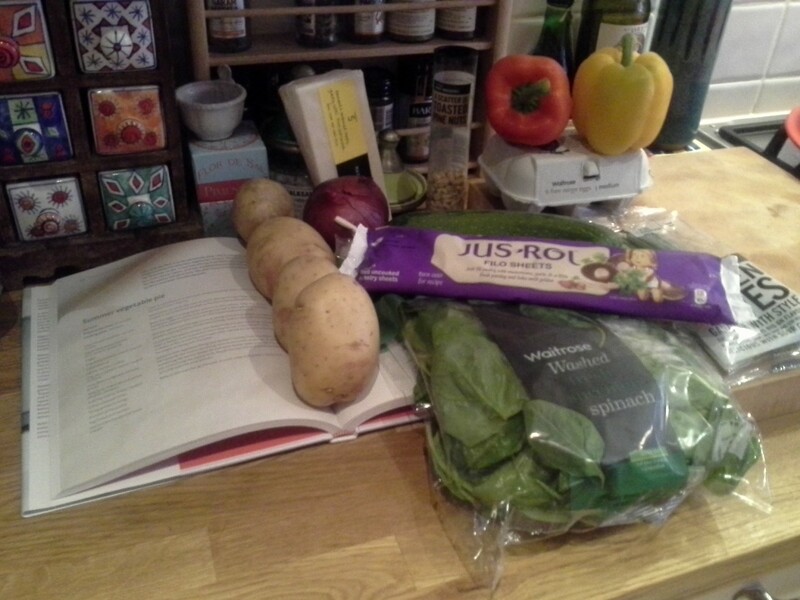 Tonight we are starting with a summer vegetable pie, prepped in the morning and cooked in the evening…..
Lots of potato, peppers, onion and spinach, mixed with a whisked egg and grated mature cheddar and placed in filo pastry, layered in a baking dish, and sprinkled with pine nuts. 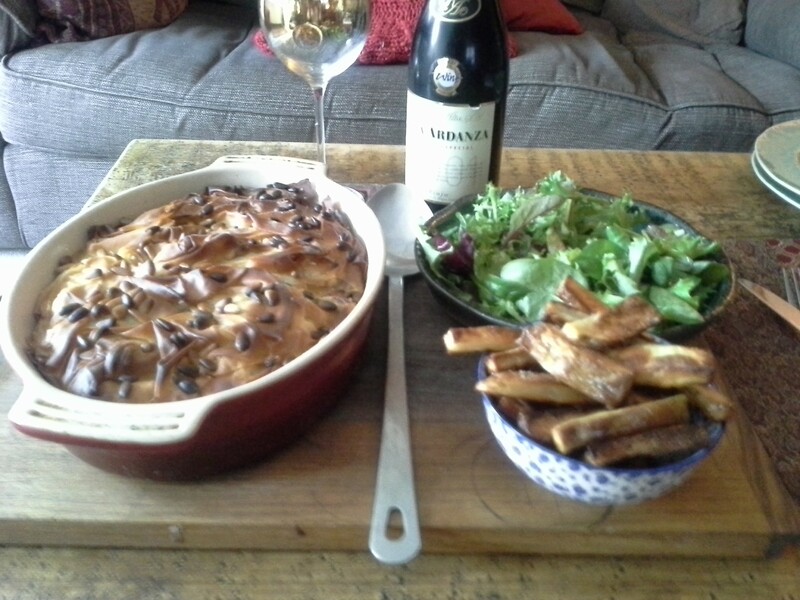 Baked in the oven for 30mins, and served with some olive oil baked potato slices and salad. A really lovely, light and summery pie. Our plates were cleaned off, and the remainder will make it to work with me tomorrow for my lunch. The book is filled with many more sweet and savoury pies and I look forward to tasting the rest of the book. This week has been a long one with some long days and long drives. 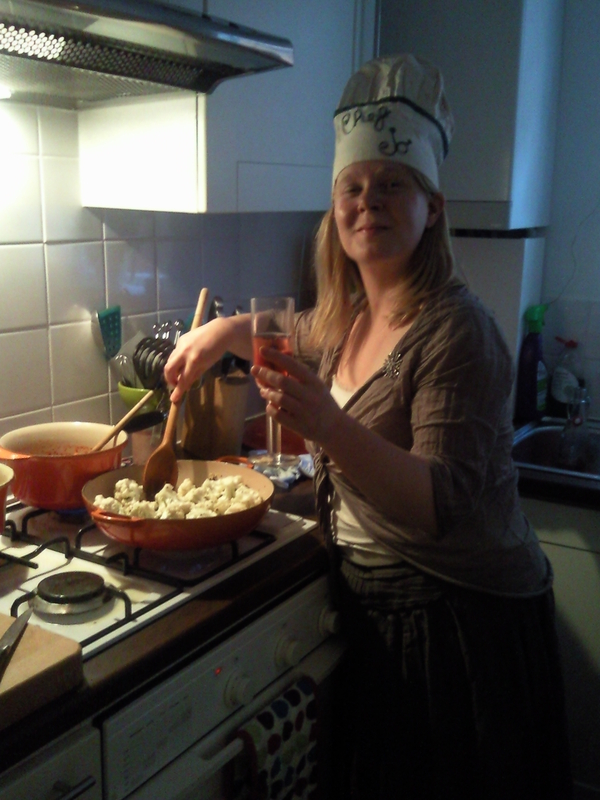 Because of this I have been extremely lazy and we have had takeaway, Pieminister pies, and tomatoey pasta. However, I look forward to a food filled weekend ahead! 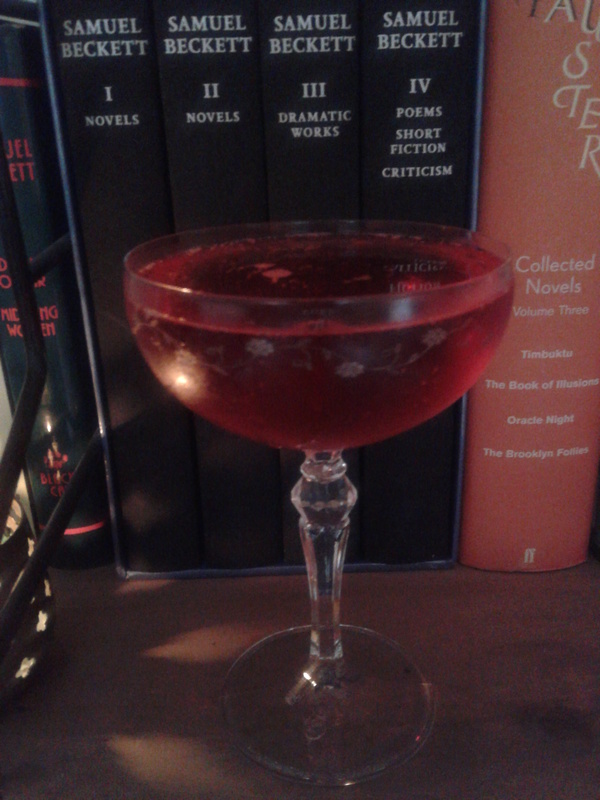 A Campari for the weekend….. I became fond of a Campari or an Aperol on my hols the year before last in Venice. Topped up with prosecco this is a perfect aperitif, and the sunshine made me break open a bottle to welcome in the summer! In a baking dish place the potatoes in a layer. 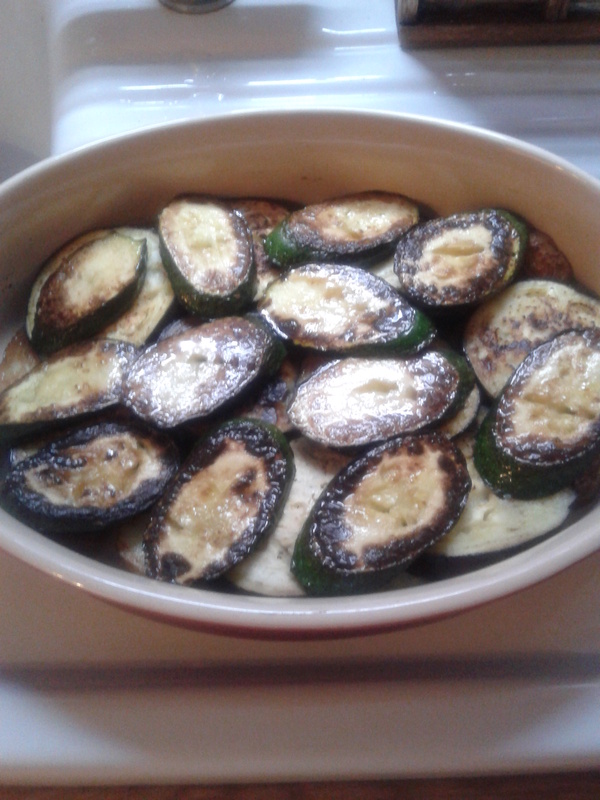 Top with a layer of aubergine, the courgette, and then pepper. In a separate pan add a splash of olive oil and fry the garlic for 1min. Add the wine and reduce by 1/3. Add the tomatoes and a tin full of water and reduce until thick. 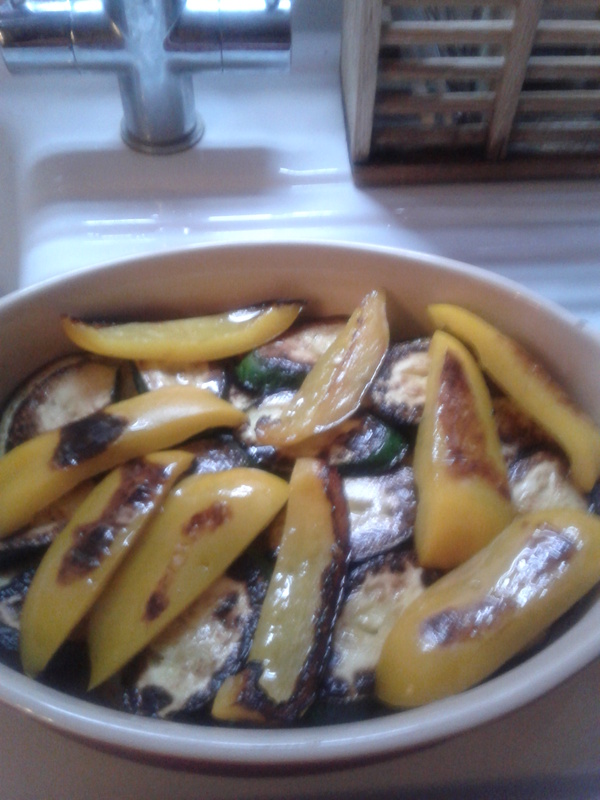 Pour the sauce over the vegetables and bake in the oven for 30mins until bubbling away nicely. Washed down with some delicious Valpolicella, and accompanied by some roasted beef, this was a lovely Sunday night dinner.